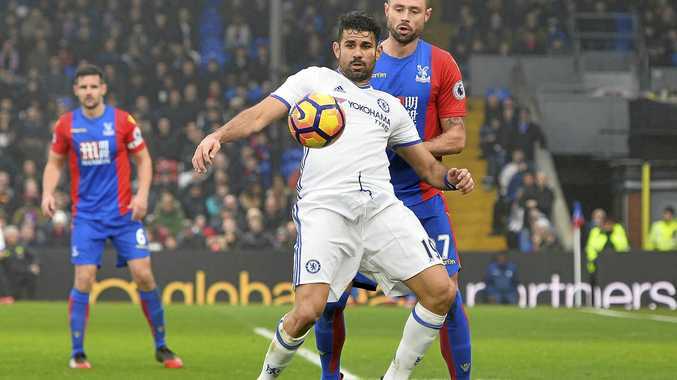 DIEGO Costa's 13th goal of the season has propelled Chelsea nine points clear at the top of the English Premier League with a 1-0 win at Crystal Palace. It was the Spanish striker's 50th goal for the Blues, who celebrated an 11th straight EPL success. Chelsea has now won 14 out of 17 times under Antonio Conte - a new record for a manager in his first EPL season. Conte's men stretched their lead over Liverpool, which plays the Merseyside derby with Everton on Tuesday morning (AEST), and Arsenal, which plays fourth-placed Manchester City tonight. "If I don't say I am pleased for this record I am dishonest,” Conte said. Manchester United continued its winning ways with Zlatan Ibrahimovic scoring his 15th and 16th goals of the season in all competitions in a 2-0 win over West Bromwich Albion at the Hawthorns. Ibrahimovic has now scored 10 goals in his last nine games as the Red Devils joined Tottenham in fifth on 30 points but remain behind the London club on goal difference. It was United's fourth successive victory, the first time that has happened since Jose Mourinho arrived in August. Champion Leicester salvaged only its second away point of the season despite having striker Jamie Vardy sent off in the first half and going 2-0 down at Stoke. Vardy was red-carded in the 28th minute for a poor tackle on Mame Biram Diouf before Bojan Krkic and Joe Allen gave the home side a two-goal advantage. The Foxes were a different side after the break, however, and managed to sneak a draw thanks to Leonardo Ulloa and a late leveller by Daniel Amartey. At the bottom, Patrick van Aanholt's goal helped Sunderland to a 1-0 win over Watford as it climbed off the bottom of the ladder. Hull is on the foot of the table, despite hitting the post three times at West Ham. The Tigers went down 1-0 after Mark Noble scored from the penalty spot for the home team. Swansea City dropped to second-bottom after another feeble away loss, this time at Middlesbrough. Having conceded three goals in a 3-1 defeat at West Brom in midweek, Bob Bradley's team again showed its defensive frailties in a 3-0 loss at Middlesbrough as Alvaro Negredo (two) and Martin de Roon piled more pressure on the American and the Swans.